Anyone who reads my reviews (when I actually do write one) probably knows that not only do I like to listen to all the new releases that come out but that I have a very wide ranging of music genres that I enjoy listening to. I happen to have a soft spot for albums that are put out under the radar and especially when using their own original material. A few months back I had seen that Dov Levine’s son Yisroel Levine, was working on an album with fellow Waterbury bochurim. It really piqued my interest. The short fifteen second “preview” clips posted on social media helped and so did the fact that Dov was one of my favorite singers when I was growing up. But that’s not what really got me excited. A group of friends singing their original songs that do not sound like the typical yeshivish songs coming out today….that really got my interest. Then they released one of the songs from the album as a single for free, Hashem Melech. WOW! That really got my attention. The rest of the album did not disappoint and I have been waiting ever since to have the time to write up this review. The songs are catchy, arrangements fresh and original (and chock full of guitars), harmonies top notch, and there is a real fun vibe that bursts through when listening to it. Another very cool thing about this album is how the arrangements were a collaborative effort on each song and not just one person arranging the music on a specific song. There is a reason why the arrangements sound like they do! Jewish music superstars Nochi Krohn and Aryeh Kunstler, were joined by relative newcomer to the Jewish music scene, Alex Bodnar, and a number of the lead vocalists on this album to arrange the music. Ani Maamin- what an upbeat and fun sounding song to begin the album. The song is composed by Yaakov Blatter who is joined by Shloime Liff for the lead vocals. The arrangements feature a lot of rhythm guitar and percussion which gives the song a very laid back but still enjoyable feel. Gam Ki Eilech- This hartzige ballad is a close as you will get to a main stream song from this album. Yisroel Levine composed the song and he is joined on the vocals with Yoav Nathan, Kalman Mandel, Menachem Rozner and Pinny Schachter. This is a very sweet song that is enhanced by some really nice harmonies and violin solos. Hashem Melech – You already know how I feel about this song but I can get more specific. First of all, this song really is a microcosm of the whole album just by seeing that it was composed by four people! The song starts off with a sick guitar solo (which have Aryeh Kunstler’s name written all over it), the arrangements build up to even include a brass section and a Ron Bertolet saxophone solo. The vocals, arrangements and harmonies on this song are perfect and amazing. Psach Libi – This is another solid composition by Yaakov Blatter. The lead vocals on this song are really nice. The violin is featured on this song as well. Hold On – This is a catchy song with some really cool ukulele riffs and vibraphone/marimba solos. The lesson of the song is pretty deep and very true. Give it a listen! Ki Avi – This is a somber and hauntingly beautiful ballad composed by Menachem Rozner, who is also one of the main soloists on this song as well. The harmonies are beautiful (have I mentioned that before), the guitar solo and the violin solos are really nice as well. There are so many places on the album where the music stops and they sing harmonies together that are jaw droppingly beautiful. I know, I made that word up. Yismechu – This song starts with a clarinet solo by the incomparable John Tendy (if you know him from the Jewish music scene you’d know what I mean). This song is very relaxing to listen to. Mishoich – A classic Kumzitz song, this song is composed and sung by Yoav Nathan. The vocals are nice, the harmonies are even better, and the guitars on this song….well you get the picture. Min Hametzar – I have a special place in my heart for people singing and performing their own songs. This song is composed and sung by Pinny Schachter, and he plays piano on this song as well. It is a beautiful and hartzige song. The addition of the English words add so much meaning to the song. Oseh Shalom – Yisroel Levine composes this upbeat song and he along with Pinny Shachter are the main singers on this song. The musical arrangements on this song consist of guitar, bass guitar and drums but they are in no way simple. The harmonies are once again top notch. Elokai – This is another beautiful song on an album full of gems. This song, composed by Sruly Rubin, who also is one of the main singers on the song (see a trend here?). Beautiful vocals, beautiful harmonies, and beautiful music! Stay With Me – the title track of the album is saved for the twelfth and last track of the album. It is another Yaakov Blatter gem and I think all the compliments from earlier songs could be applied to this song as well. In conclusion, if you enjoy Jewish music, this album is for you. The wide ranging styles of songs on this album are sure to be enjoyed and played over and over. It’s been on my playlist since it came out and I am enjoying it more and more with time. 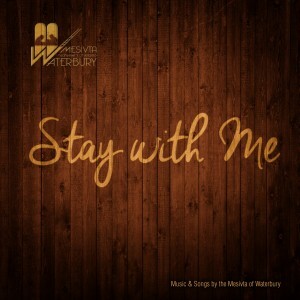 The album is available at http://mostlymusic.com/products/mesivta-of-waterbury-stay-with-me and anywhere quality Jewish Music is sold!